So I’ve had a great weekend down at my parents place in Cornwall. After a weekend of great food, as always when I visit my parents we had dinner tonight that I though was well worth a special mention. Now, I didn’t cook this but I’ve got the recipe from my step mum and you should for sure give it a go. It’s so simple but it was so tasty. 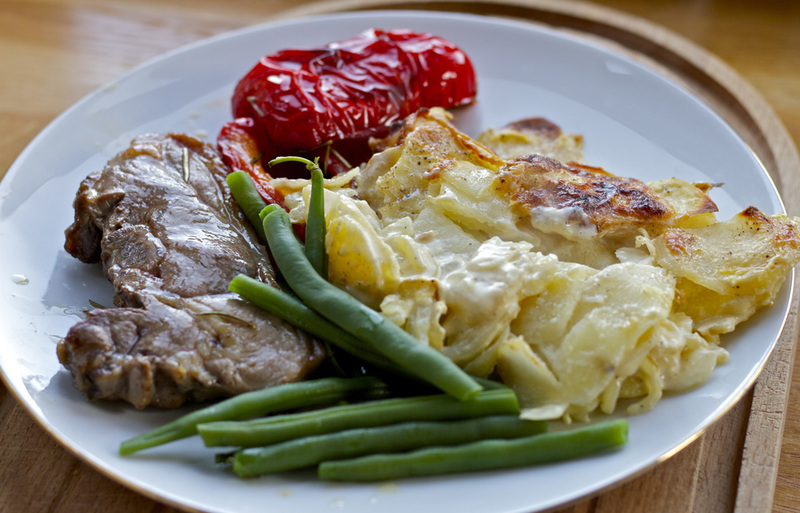 It was a great bit of lamb roasted with red peppers, garlic and rosemary served with green beans and potato gratin. With a nice little dollop of mint jelly on the side. So good! Ok so the potato pie or gratin if you’re feeling french. It’s really simple. Desiree potatoes enough to fill the dish you are using, the size depends on how many people you are feeding. you would sometime use garlic but this meal uses garlic elsewhere so for this I wouldn’t bother. For the kind of dish to use I’d use something like a pyrex dish no more than 2 inches deep, if it’s too deep it wont cook properly. Rub some butter around the dish so it doesn’t stick too much. Slice the potatoes into fine slices. I’d say about 1-2mm thick. If you’re not so good with a knife or not so confident then either man up or use a smaller knife as you have a bit more control. Some people have these fancy machines that slice things like potato perfectly into 1mm slices but I don’t have one and I’m guessing the majority of you don’t either. Some people use a Mandolin, I tired it once but got confused and tried to use a banjo…didn’t work. Ok, so lay the potato into the dish. I’d say we want 3 main layers so it wont just be one layer of potato, it might be 3 or 4 slices of potato on top of each other covering the dish, now chuck some finely sliced onion and a bit of grated cheese and a drizzle of cream (don’t drown it in cream) then salt and pepper. Then next layer, more potatoes, onions, cheese, cream salt and pepper. For the final layer do potatoes, a tiny amount of onion then just cream salt and pepper. Don’t worry about the cheese on this top layer. Because we are putting it in the oven for a while the cheese might burn if it is on the top. Now chuck in the oven on 210°C for 50-60 mins. After about 40 mins pull out the oven and grate a bit of parmesan or more cheddar on top then back in the oven for 10-15 mins so the cheese goes a bit golden. For fan ovens reduce the heat slightly. Lamb good quality lamb chops. 1 for each person if they are large, 2 each if they are small or if they’re large and you’re feeing a load of greedy buggers. Garlic 2-3 cloves finely sliced. After the potato has been in for 20 mins season the quarters of red pepper with salt and pepper, a dash of olive oil and add about 2-3 cloves of garlic finely sliced and chuck all into a roasting tray or something suitable for the oven. Now, grab some fresh rosemary and tear some into the dish and mix up. Chuck in the oven. Give this 10 mins then season the lamb with salt and pepper and sear in a frying pan on both sides. We want to be using a high heat. After about 2 mins on each side add to the roasting tray with the red peppers. Then chuck it back into the oven for a further 20 mins. with 10 mins to go boil some water in a pan, add pinch of salt and cook the beans for about 4-5 mins. Drain and season with a tiny bit of salt and pepper and a knob of butter. Serve all on a plate, bit like in the picture. This goes great with mint jelly or redcurrant jelly. So simple but such a great feed! You have to try it. If you’re a vegetarian then unlucky…haha no not really. Roast the peppers without the lamb and serve it with a nice mixed leaf salad and some grilled Halloumi. (use the juice from the roasted peppers as a warm dressing). Sorted.